I love almost every Critical Thinking Press product I have tried, so when I had the opportunity to review three of their products through Timberdoodle, I jumped at it. Richard had the chance to work with Mathematical Reasoning, Level C, which is meant for 2nd graders. I have heard great things about the new series, but had never seen the books. What I got was huge! I was expecting an 8.5x11" book, but I guess I wasn't expecting it to be over 300 full-color, high quality pages. 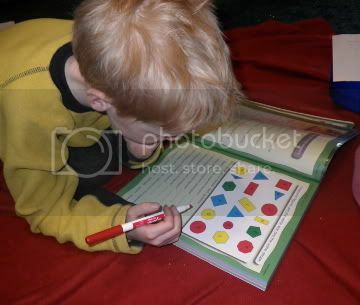 He doesn't always want to do more than a page or two, but he loves the color, and he usually enjoys the activities. This is a spiral approach, with quite a few topics being introduced, and you keep cycling back to cover, say, addition again and again. This book is perfect for this child, and now I want to get some of the earlier levels (Level A is Kindergarten, Level B is 1st grade) for his little sister. Some of the pages in this book are going to be a little challenging for Richard, but that is because he is only 6. 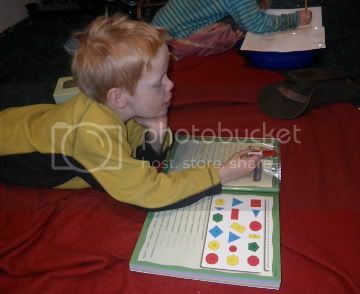 As a first grader, he is solidly doing 2nd grade math, but he reads at a 6 year old level. For those pages, I do have to be sure to be there and let him dictate answers instead of necessarily writing them out. For a more synchronous child, this shouldn't be a problem. Here he is trying not to get annoyed at a camera and pretending he is actually working. But this picture does give you a feel for the layout of the book. It was too workbooky for William right now! The exercise pages are all set up in a similar manner. There are a couple of focus words (claim, equ). Then there is a little chart defining a couple prefixes (ex-, pro-), a couple of roots (claim/clam, equ/equi, voc), and a couple suffixes (-ate, -ation, -ity). Then there are two types of exercises. One lists words (exclaim, proclamation, equation, equity, equivocate) and definitions. The student is to identify word parts (circling roots and underlining prefixes and suffixes) and then match the word to the definition. So proclamation would include the prefix pro (for, before, forward), the root clam (call out, shout) and the suffix ation (an action or process). The definition is "something announced officially in public." The second exercise has the student putting each vocabulary word from the first exercise into a sentence. There are also "extension" exercises -- essentially review exercises -- after every 7 pages of the regular ones. These include matching words to definitions, choosing the correctly spelled word, and choosing the best word (of two) for some sentences. I love this aspect too. What Connor likes about this book (paraphrasing what he is saying to me, as I can't keep up) is that it helps him to deconstruct words. There are great vocabulary words -- many of which he says he already knows -- but by using this book he can better understand the meanings and origins of the words. He also felt it helped him with spelling complex words (and believe me, I'll pay top dollar for anything that helps him understand spelling!) He felt that it helped him to better understand his Latin studies too, linking the Latin he has studied to the English that he knows even better. 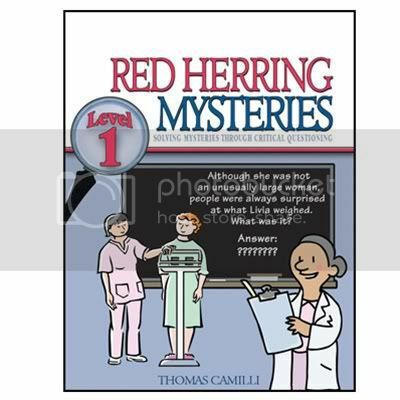 Finally, we received Red Herring Mysteries 1 for Thomas. This was not at all what I expected! We had a great time with this book, and it turned into a family project instead of just something for him. The idea with this book is that there is a statement made, and the students are supposed to ask yes or no questions to discover the answer. There are a number of "tricks" in these little stories -- at some point in every mystery someone would quote Princess Bride -- "You keep using that word. I do not think it means what you think it means." For instance, "how much she weighed" has nothing to do with stepping on a scale. How we ended up using this is I would write out the "mystery" on a whiteboard, and the kids would take turns asking questions. Usually, they worked together to solve the mystery, discussing each of my answers before the next person asked another question. There was some guidance provided for the teacher in how to interact with the students, leading them, if necessary, to ask questions that would give them the key to the puzzle. I am very pleased with all three of the books, and definitely plan to continue to use them -- and probably to purchase more in each series. Disclosure: As a member of Timberdoodle's Blogger Review Team I received a free copy of these books in exchange for a frank and unbiased review.